Lighting charging cable built in makes Tronsmart Prime so special that it fits just right into your new iPhone 8 & iPhone 8 Plus & iPhone X. With enough capacity of 10000mAh,one do not have to worry about a dead phone because of all the picturing, maps searching,navigation, music listening on-the-go. If you ever forgot your cable when hanging out or experienced a cable mess in your bag,The Tronsmart Prime help you to get rid of this awkward moment. 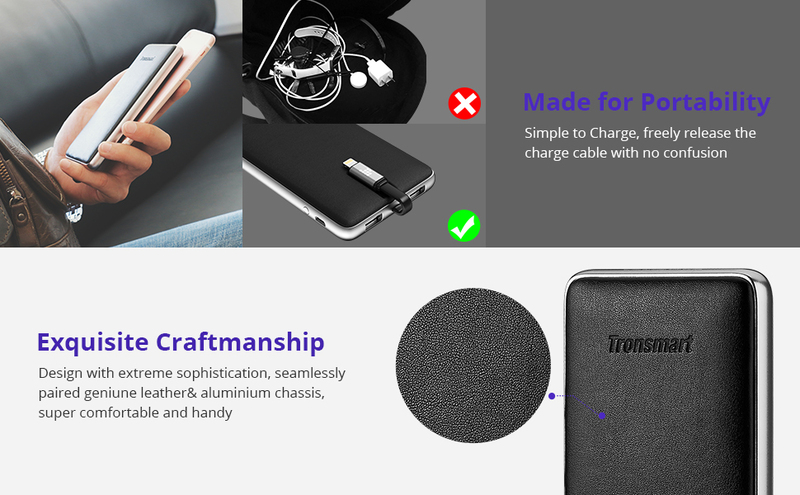 The capacity of Tronsmart Prime 10,000mAh/37Wh falls within Federal Aviation Administration's safety limit of 100Wh.It means that the Tronsmart Prime is allowed to be taken on the plane, as long as it's packed in your Carry-on Luggage. Output USB 1 & 2: 5V/2.4A in both ports. Each port is optimized to amplify and provide the same output.